Organs needing an immediate rescue! This is for organs which have been In Danger which have been saved from the buldozers or other threats and given a further life . . .
Do you want an organ? A house organ? Or an instrument for a Church or Concert Hall? Do you want a pipe organ? If so, posting what you're looking for could inspire people to come forward with available instruments that need rescue or organ builders with inspired suggestions. Do you want an electronic? Someone might have just the electronic you're looking for or one that you might modify just using the console. 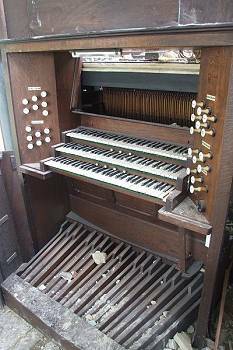 Do you want to replace a pipe organ by an electronic? Then if you are brave enough to post here, someone might come forward with a way to rescue your pipe organ for you or elsewhere, persuade you that it's going to be ever so much temporary fun or that you're making a big mistake . . . but in any event it will enable proper debate among informed and knowledgable people who can give helpful advice and possibly avoid your church being clocked up by the electronic manufacturers' trophy hunter webpages listing pipe organs that they have succeeded in killing. Restoration: ideas, techniques and principles - restoration vs conservation - do building conservation principles apply, that any work should preserve the integrity of the original instrument and any new work should be identifiable, not confusable with the old? Choosing the right stops can be a challenge and there are always confusing alternatives. Different instruments of different eras require different approaches. Please post details of any exciting organ courses coming up . . .
Are you looking for tuition, an organ teacher. Is there anything anyone needs help with in their studies? Meetings, announcements, outings and events. What is the most inspirational instrument you know of? There are lots of favourite holiday places near where good and interesting organs happen to be . . . Did you stay near a good organ last holiday? Please tell us about it! Andratx, Mallorca, Southern Spain, South of France, places in Italy immediately come to mind . . . 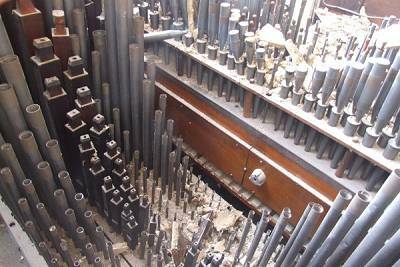 Pipe organ builders are invited to post news of current restorations, new commissions, repairs, successes and failures, taboo ideas. Self promotion here is not only permitted but encouraged! 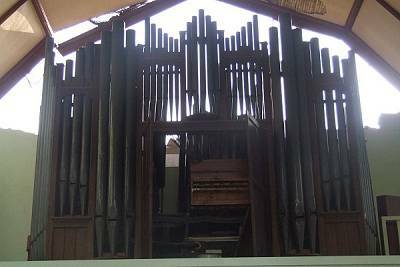 Whilst purveyors of electronic simulations might call themselves Organ Builders, this forum encourages pipe organs. As one listens more to Bach and earlier in Unequal Temperament one gets bored of equal temperament. Furthermore one rarely has the opportunity to hear 19th century works in the temperament for which they relied for tone colour and emphasis, particularly Mendelssohn and Cesar Franck. In Equal Temperament musicians have to work in expression that is built into the key and the music in Unequal Temperament. What repertoire is excluded by specifying unequal temperaments for pipe organs? Users of Hauptwerk can contribute significantly with experimentation and others with temperament enabled instruments, please let others know the results of your experiments. Temperament can make classical music more interesting. Whilst concert pitch is accepted as the norm many organs are 1/4 tone sharp or 1/4 tone flat with C=256. Does C=256 relate better to an 8ft pipe. Is there an influence on the human from sound at absolute frequencies? Should pitch be considered absolute rather than relative? Harpsichords have always been an option for organ practice at home. Easy to tune, they can be an experimental breadboard to try the effects of temperament as well as getting into the spirit of the Baroque. Sometimes with the Claviorganum, an organ was incorporated . . . truly divine. Exciting organ recitals coming up . . . Do look at http://www.organrecitals.com as well . . . Are you giving a concert? Tell us about it here - why you love the programme you're doing and why you have chosen to do it on a particular instrument . . . Exciting organ recitals coming up by young musicians under the age of 25 . . . Are you giving a concert? Tell us about it here - why you love the programme you're doing and why you have chosen to do it on a particular instrument . . . Sometimes one comes across a concert which is outstandingly unique or possibly academically interesting. This is the place to post details of it! If you are promoting classical music and organs on a radio station please post details of your programmes and times when people can tune into internet radio. It would be great if you might enthuse about why you're including specific items of music or featuring particular artists or instruments . . .
From home made to respected pipe organ builders, house organs are an important genre and enable organists to practice and, in some cases, to perform at home such as the example formerly at Glyndebourne. Often home made instruments are the subject of experimentation and this can often be extremely interesting. Should house organs always be small or can they strive to being grand? Can small organs be made to be more interesting or versatile? Purely electronic instruments are not to be covered here as there is a specific category for them. Programs such as Hauptwerk and GrandOrgue enable computers to replay note samples, note by note, stop by stop. It's not always easy to achieve a good sample set . . . and therefore an important area in which to share experience and discuss projects. Compton Electrones contain electrostatic generators utilising dangerously high voltages which some enthusiasts find incredibly exciting - so this section of the forum is just for them! The EOCS is a great meeting place for people building instruments from Hauptwerk or other digital or analogue technologies for use at home or larger venues, or adding pipes to electronics. EOCS members are often involved in pipe organ building and restoration projects and major pipe organ electronic control systems have been designed with EOCS member expertise. Wurlitzer, Christie, Compton, Gavioli - names evocative of a bygone age of light music and great jollity. Hope-Jones and brilliant perverse genius. The unsung heroes of the organ world, loved by Liszt and providing opportunities for organ practice at home before the days of electronics as well as doing a turn in smaller chapels and churches. French instruments differ from English instruments and American Organs and some instruments with two manuals and pedals are far removed from folding portable instruments that presumably arrived with missions in India and which have become a mainstay of indigenous Indian idiom. Many instruments are hampered by bad acoustics, short reverberation times and carpeted spaces. Can they be improved, naturally and or electronically? Meanwhile instrument cases have their own acoustics and speak into their spaces in different ways . . .
Do you have anything to sell relevant to music and organs . . . or perhaps not . . . or are you looking for something? Post details of your sales and wants here. Consider carefully whether you want to invite interest generally or confine to members only. If you make a posting which gives a link to a site about an organ or organ builder please can you duplicate the link here as a central resource? Online and printed resources. Please place useful links here . . . or if you have some to sell, you're welcome to advertise it here. Please post YouTube or other recordings here of reference value . . . or simply because you enjoy them! Please can you give a description as well as a link. Organs tend to be in religious places . . . and so atheists tend not to like organs at all . . . and after all it's quite appropriate to reject the idea of god as a big daddy sitting on a cloud. Sadly many people never get beyond that rejection . . . so this section is to see how a bigger view might be achieved, perhaps so that people don't feel they have to be excluded and so more may be happier coming in to hear or play organs. Has the organ has helped in your faith, or are there thoughts which might help others in their faith. The decline in interest of the organ coincides with the decline of numbers of young people being introduced to it in Church. How can Church and Faith be appreciated as more relevant to live than current perceptions would appear? Organs play an important part of ritual. Many people think they can live entirely without Churches and have not heard of prayer, and appear to do so satisfactorily. What effect does faith, any associated religion and rituals have upon our consciousness? Is there a need to pray for protection from the dangers and perils of this night in the modern age? As the consciousness dawns that we are on the last drop of the earth's oil, now having to go deeper and further to extract it, energy, transport, resources, food will become more and more expensive to the point of unobtainium. Only communities who have come together to share local resources in the manner described by an understanding of God, coming together, will survive. The Church has much to give to the community and in due course this shall be valued. This section of the forum is here for those wishing to explore how we plan for the future, before the future plans for us. Launch your fundraising project for a Church here . . .
On the brink of loss . . .